Taipei is a city that has many outdoor attractions. Whether it is parks, temples, gardens, or the night markets, much of daily life is spent in the midst of the bustling city streets. Taipei’s bike sharing system, YouBike, is a great way to get out and see some of the incredible sites Taipei has to offer. 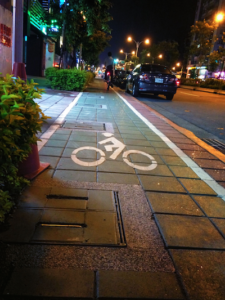 In 2009, the Taipei City government teamed up with Giant, a world-renowned bicycle manufacturing company. 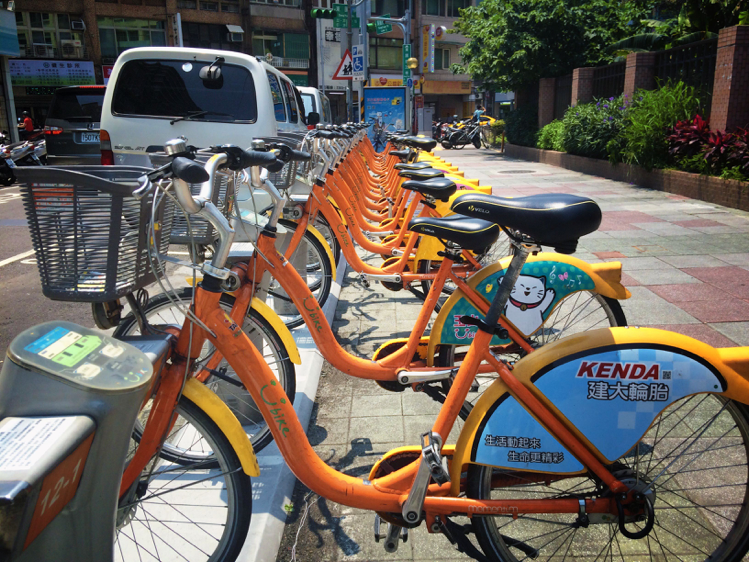 YouBike started with only 11 kiosks in the Xinyi District of Taipei. Now there are 190 rental stations with over 6,000 bikes in circulation! 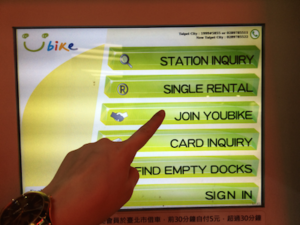 YouBike has also stationed kiosks in Taichung, New Taipei, Changhua County, and Taoyuan. In order to check out a YouBike, you will first need to buy an EasyCard. 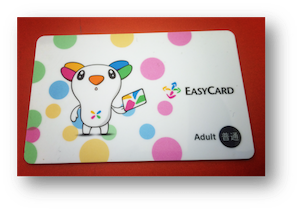 This card is an essential purchase in Taiwan because it is used to access the Taipei Metro, buses, and taxis. You can even use the card for purchases at convenience stores. 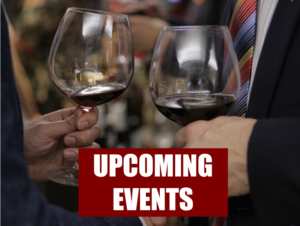 Cards can be purchased at 7-11, Family Mart, or any other major convenience store. For further information about the EasyCard, you can visit their page here. The process of registering the EasyCard for YouBike is quick and easy. Do note that the only way to register your EasyCard is to have a Taiwanese cell phone number. If you are just visiting Taiwan, you can purchase temporary SIM cards from major Taiwanese carriers at the International Airports. The next step is to register the EasyCard at any of the YouBike computerized kiosks. To find a YouBike station, you can download the YouBike app and check the map to see the station locations. You can also typically find YouBike stations outside of most MRT stops. To register the EasyCard, just follow the instructions on the screen. Directions are available in both Chinese and English. Then you will need to agree to the terms and conditions. Finally a confirmation code will be sent via text message to your phone. Submit the given code, and then place your EasyCard on the sensor. In a matter of seconds you are ready to ride! Simply click “JOIN YOUBIKE” and you will be on your way! 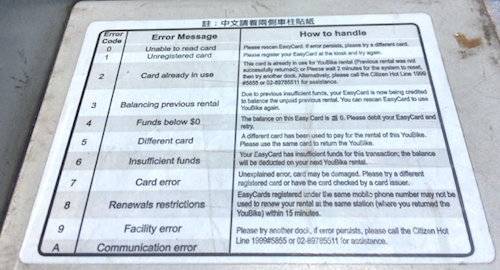 If a visitor does not have a local Taiwanese cell phone number, they cannot use the EasyCard for YouBike transportation. However, there is an option to use a credit card registration instead. To do this, select the “Single Rental” option from the screen. Then agree to the terms and conditions and follow the instructions for inputting your credit card information. YouBike puts a temporary hold of NT$2,000 on the credit card until the bike has been returned. Once the bike has been returned, the proper amount will be credited and the hold will be removed. The cost of renting a YouBike is based on the duration of use. The first 30 minutes costs a mere NT$5. After the first 30 minutes, the rider is charged NT$10/ per half hour for the next 3.5 hours. After four hours of use, the rate increases to NT$20/per half hour for the next 4 hours. The final rate increases to NT $40/per half hour if the bike is used longer than 8 hours. Checking out a YouBike is extremely simple! First select a bike from one of the kiosks. I suggest checking the seat and tire pressure to make sure the bike’s condition is suitable. The YouBike maintenance crew is quite efficient in picking up faulty bikes, but occasionally a bike might have a loose seat or a flat tire. After choosing which bike to ride, swipe the EasyCard on the “Sensor Zone”. When you hear the beeping sound, you can remove the bike. A screen will also display your balance, so you check how much money is on your EasyCard. More money can be added to the EasyCard at convenience stores or inside any of the MRT stations. Occasionally an error message might appear. In that case a number will pop up to let you know what the issue is. Each number corresponds to a different error message, so just check the number to see what the issue might be. There is a chart adjacent to the sensor that has the numbers and their corresponding problems. If the sticker only displays the problems in Chinese check the adjacent bike slot for English instructions. In many neighborhoods there are bike paths. If the bike paths are not marked on the sidewalk, just stay to the side that is closest to the street. In some cases the sidewalks may be too narrow or crowded, in that case it is acceptable to ride in the street. Just make sure to follow traffic rules and stay to the far right. Conveniently marked bike lanes are throughout the city! Though it is quite easy to ride anywhere in the city, I highly recommend taking the YouBike to the riverside. 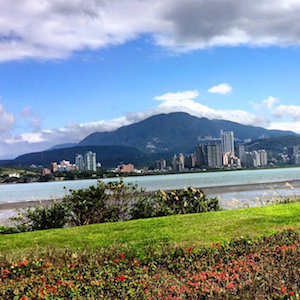 The best places to access the river are at Songshan, Gongguan, Tamsui, and Yuanshan MRT. The river path is rarely crowded, and it will give you the freedom to ride as quickly or as leisurely as you prefer. Returning the YouBike is just as simple as checking it out. You do not need to return it to the same station. First you can check the YouBike app. On the app, a map shows the locations of all of the stations. The app also tells you if the kiosks are empty or full. Option two is to visit YouBike’s website. The website has a map feature to assist you in finding the bike stations. The final option is to use Google Maps to find the closest MRT. If you can find an MRT station, then you should be able to locate a YouBike parking zone close by. When you arrive at the YouBike station, just slide the bike into the lock and scan your EasyCard. The card should beep and show your remaining balance. Also, if you want to park the bike, have no fear! There is a lock feature, so you can leave the bike anywhere you would like. 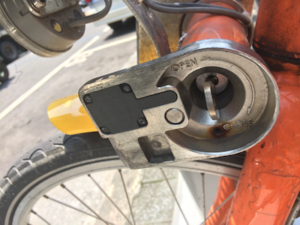 On the front wheel of the bike, there is a removable key and a cable attachment. Simply, just secure the bike wherever you wish using the attached cable. Just be careful not to lose the key! By choosing to ride a YouBike, you can get great exercise while also decreasing your carbon footprint! You can explore more area than would be seen on foot, and you can easily access any point of the city. I highly recommend to anyone, young or old, to get out and enjoy a ride!